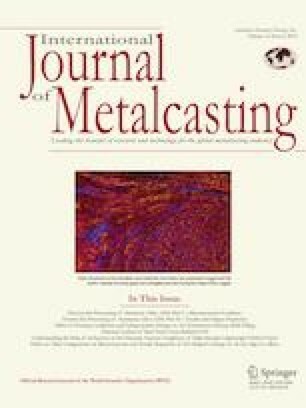 A new process for preparing fiber-reinforced silica sol shells for investment casting is proposed. The influence of fiber length on bending strength of shell is studied under the condition that fibers are not agglomerated or clustered. Polypropylene fibers were suspended under the action of air currents and adhered to the surface of shell with back-up slurry in the fiber placement device. Three millimeter and six millimeter lengths of fiber were used as reinforcing agents for the investment shell. The results showed that fibers could be placed uniformly on the surface of shell with slurry by air flowing in the fiber placement device, thereby enhancing the strength of the fiber-reinforced shell. Green bending strength of shell with additive of 6-mm-length fiber was higher than that of 3-mm-length fiber. This was due to the fact that the fibers were scattered into a reticular formation and the action of bridge connection between the longer fiber and matrix was stronger. Compared with the fiber of 3 mm length, the scanning electron microscope morphology of 6-mm-length fiber had typical characteristics on the fracture section of shell, which meant that fiber was pulled out from the shell with large mechanical force. This project is supported by National Natural Science Foundation of China (Grant No. 51865042); National Natural Science Foundation of Inner Mongolia (Grant No. 2018MS05051); Science Foundation for Universities in Inner Mongolia Autonomous Region of China (Grant No. NJZZ17080); and Inner Mongolia University of technology Foundation (Grant No. X201412).